Hey, everyone! I hope ya’ll had a fantastic weekend! I had sucha crazy one. My brother graduated from Illinois State University this weekend and then, of course, it was Mother’s Day on Sunday, so I’ve been celebrating all weekend! I actually haven’t even been on here in 3 or 4 days because I’ve been so busy. But I’m back and at it today with a Gotta Have It or Live Without It makeup review comin’ at cha! Confession: I’m a face makeup/product hoarder. Foundations, concealers, face washes, exfoliating scrubs… you name it, I love it! And I’m willing to try anything at least once! Hey, all in the name of beauty, right? haha So, naturally, the product that I have for you today is Witch Hazel. The brand that I purchased (actually, the only brand I’ve ever seen) is Dickenson’s Witch Hazel. You can get it at any drugstore in the first aid isle and it comes in a biiiig see-through bottle. The product actually just looks like water, it’s just a clear liquid type thing. Because it is a water-type consistency, it’s impossible to use it as a spot treatment or anything like that. This is something you’ll have to rub in. 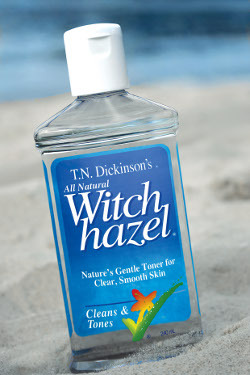 The most popular use for Witch Hazel is as a toner, which is what I’ve been using it as. During the trial period that I’ve been tryin’ this product out, it’s replaced what I was using before, which was my Tea Tree Oil (see the full review on that in my April Favorites post, here: https://psmeganelizabeth.wordpress.com/2014/04/30/april-favorites/ ). Now, before I go on, we need to have a serious chat about something. If death had a scent, it would be Witch Hazel. I don’t know what it is with me and smelly products (Tea Tree Oil smells quite disgusting as well! ), but I’ve pretty much grown used to them by now. The good thing about the smell? It’s not near as strong as the Tea Tree Oil is! Thank goodness. Now on to the fun stuff! Besides the stench, this stuff is actually pretty rad. It’s super easy to use and gives amazing results. To use it as a toner, you can either pour some on a cotton pad and wipe it over your face or you can mix your moisturizer with it and rub it on your face that way. I’ve been applying it with my moisturizer. During the 2 weeks I’ve been using this product, I’ve actually noticed quite a difference in my skin! It cleared up any breakouts I had within a few days, soothed any soreness (this would be perfect for sunburns), and, dare I say it, I even believe that it’s minimized my pores! Maybe I’m just being wishful on that last point, but I’m pretty certain my pores have shrank. Another thing I love about Witch Hazel is that is so gentle. Some toners have the tendency to dry out skin and cause peeling, but I use this morning and night and my skin is always so fresh. I’ve never had a problem with harshness when using this! Keep in mind that I do have oily skin though, so if your skin is on the dry side, use with caution at first and then apply accordingly. If you’ve tried this before, be sure to comment down below and let me know what you think! As always, comment with any questions and be sure to give me a follow for more makeup and beauty related posts like this! Thanks for hanging out with me this morning and I’ll talk ya later! ← Common Summer Beauty Blunders: SOLVED! I had a Murad toner with Witch Hazel, and it did help to clear up my acne! However, I have super sensitive, reactive skin, and the witch hazel did irritate it a bit (I have problems with redness). I stopped using it, but if you’re skin isn’t sensitive, I do recommend it! I’m so sorry you had that reaction, that’s no fun 😦 I’m assuming you’ve probably got a great facial cleanser, but if you ever wanna try another one, I 100% recommend Pond’s! You can find it at any drugstore, it’s perfect for sensitive skin! I think you’d love it!